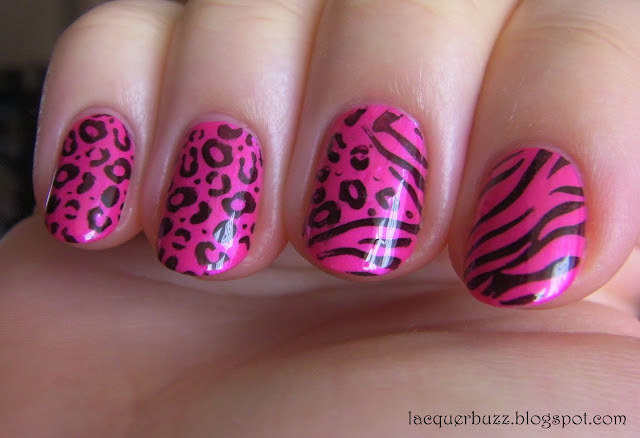 Lacquer Buzz: Zebra eats leopard! Hello my lovelies! Happy Sunday! I'm having a last relaxing day before starting school again tomorrow. Yeah, my vacation lasted exactly 3 days and a half. There's no rest for the med student, is there? Oh well. I have a very fun nail art for you today. It's fuchsia! And animal print! So out of my comfort zone! This week's theme on Adventures In Stamping was "unnatural animals" or animals you can't find in the wild. 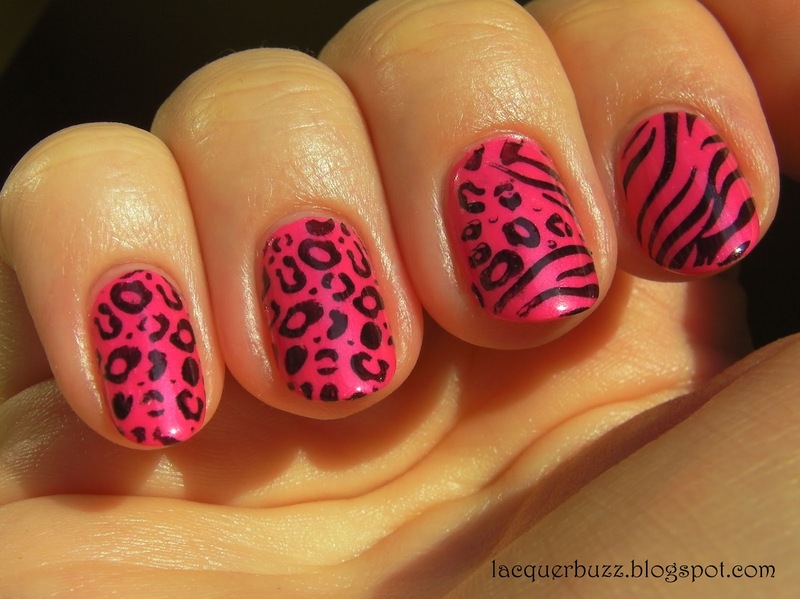 Well first of all, have you ever seen a fuchsia zebra or leopard? But most of all, have you ever seen a zebra eat a leopard? I think not! Well, it was about time for the poor little zebra to take revenge! The base color for this manicure is Essie Tour De Finance from the spring 2012 collection. It's a very pretty shimmery fuchsia. It's the first time I wear a color like this and had no idea how hard it was to photograph. I've tried everything: sun, indirect light, light box, artificial light, you name it! Nothing shows the color like it is in reality. It's cooler than it looks in the first picture. And darker than it is in the sun. It's just less pink and more fuchsia. The above picture is probably the most accurate. Honestly, my phone captured it better so if you follow me on Instagram you've probably seen it (user is lacquerbuzz by the way). I stamped with China Glaze Liquid Leather and fauxnad plates m57, m69 and m78. I then used the Konad top coat and wasn't very impressed because it had bubbles in it and I have no idea where they came from. They seem to be gone now so we'll see next time. I wasn't really feeling this color before the stamping. I was thinking that I was going to remove it after one day. But the stamping actually toned it down and made it more wearable from my point of view, so I'm keeping it a few days longer. I did both my hands in a mirrored way and had a little fun with photographing using my tripod. What do you think? These are amazing! But I've always had some sort of trouble with Konad style plates, Do you use any type of nail varnish with it, or do you use the specialty one? Thank you! I don't own any Konad polish so the only ones I use are regular polishes. They have to be really pigmented to work. aengland's and China Glaze's work best for me. Love these nails and the colour looks really pretty on you may I say. It made me chuckle that the zebra is eating the leopard! oooh I love this color!! 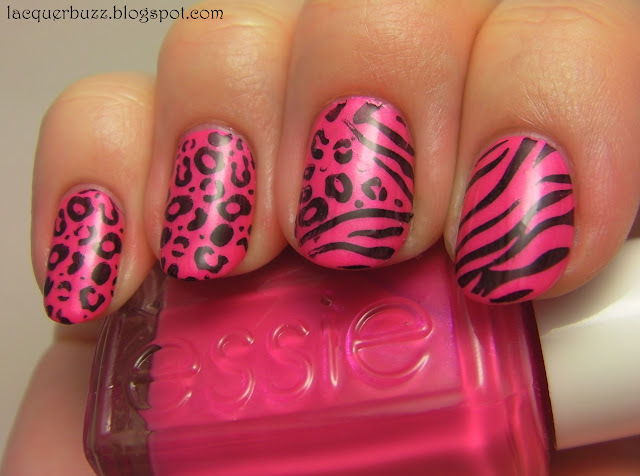 one of my fav pinks!!! 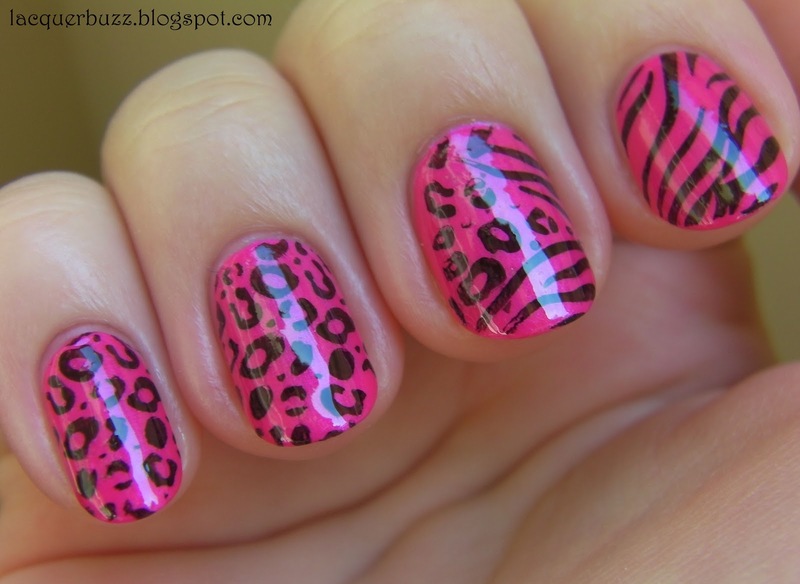 and AWESOME stamping! Thank you! It really is a special kind of pink. All the ones I see in the shops are so blah.